The clean finish and modern design of gold beads make a wonderful statement on the 14k Yellow Gold Bead Station Necklace. Strung along a chain is a pattern of gold beads in various sizes. The beads and strand are crafted with the same quality and precision seen in all Seven Seas Pearls jewelry pieces. 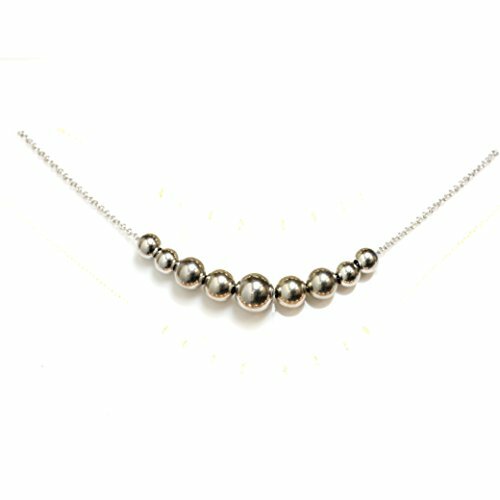 This simple necklace will make a wonderful pairing our beads bracelets and studs. If you have any questions about this product by Seven Seas Pearls, contact us by completing and submitting the form below. If you are looking for a specif part number, please include it with your message. 14k Yellow Gold 1.5mm Polished Rolo Pendant Chain Necklace 24"
Solid 14K Yellow Gold 2.5mm Concave Cuban Chain Necklace, 20"
10k Yellow Gold Unisex Natural Green Jade Teardrop Pendant Chain Necklace,18"